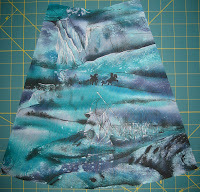 Another square dance skirt. I know I don't need more, but I just got this idea of what I wanted to do and I could hardly help myself from starting another. 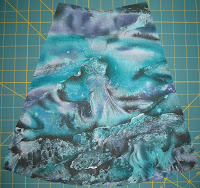 I have this absolutely beautiful fabric made by Rose & Hubble. 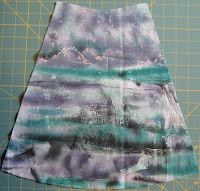 The fabric is called "The Magic of King Arthur" and I've been saving it for just the perfect project! But I bought it nearly ten years ago, and there it is, still on my shelf. Of course, while a square dance skirt isn't exactly the "perfect project," I will at least get to see and enjoy the fabric once in a while. Not just pull it off the shelf occasionally and dream about what I can use it for. It was pretty hard to start cutting, but here are my gores! I just love the gore with the dragon! I'm excited to wear this one, though unfortunately it won't be tonight. I'm not that fast.